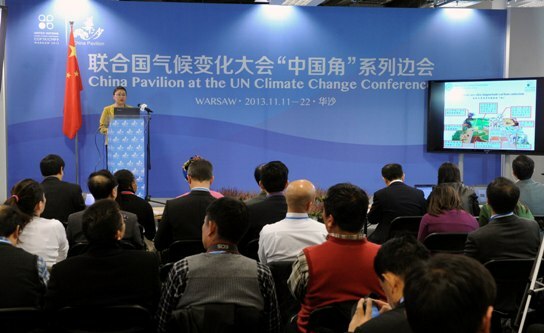 (Beijing-November 20, 2013)The “Workshop on Property Right and Standardization of Forestry Carbon Sinks”, the first “Chinese Pavilion” side event of the United Nations Climate Change Conference in Warsaw, was jointly hosted by the China Green Carbon Foundation (CGCF) and the International Network for Bamboo and Rattan (INBAR) on November 14. The eye-catching event saw participation of more than 70 representatives from international organizations and countries like Netherlands, Germany, UK, Australia, India and China, etc. Dr.Li Nuyun, Secretary-General of CGCF and Dr. Coosje Hoogendoorn, Secretary-General of INBAR, jointly moderated the side event. CGCF, the first national public-funding foundation targeted at increasing carbon sinks, reducing emissions, and tacking climate change, has organized many trans-department, trans-field and trans-specialty experts to work for many national forestry research projects for public benefit, conduct the research on the property right of forestry carbon sink, and implement trial project of “Property Right of Forest Carbon Sink Endeavors and Achieved Benefits for Forestry, Agriculture and Carbon Savings” in Lin’an City of Zhejiang Province based on the first national bamboo afforestation methodology for carbon sink, a joint research achievement by CGCF, INBAR and Zhejiang A&F University and other collaborators. On the side event, Dr. Li Nuyun introduced the research status quo on the property right of forestry carbon at both home and abroad. She emphasized the significant influence of demarcating the property right of forestry carbon sink on the role played by forestry in tackling climate changes and especially on promoting carbon trade. Li also mentioned that the successful practices, in which Australia and New Zealand have demarcated the property right of carbon sink and established related carbon sink trade mechanism through the legislation and quota respectively, and Canada has set up a carbon trust as part of its efforts to push the transfer of property right of carbon sink and realize the carbon neutralization in government and enterprise domains, were highly valuable for reference for China. According to Dr. Li, CGCF, based on its research programs, has carried out a wide range of researches on the property right of forestry carbon sinks in China, including the relation between forest property right and carbon sink property right, the research on demarcation methodology of carbon sink property right, the establishment of registration platform for demarcated property right of carbon sink, rules and standards on the reasonable shift of the property right of carbon sink; and has explored a positive incentive mechanism for farmers to protect and care forest for sustainable forest cultivation. All these active efforts have substantially reinforced the achievements made by national eco-projects like China forestry property right reform, concession of land to forestry; enhanced the adaptability of local people in forestry area to climate changes; optimized eco-environment; promoted the construction of Beautiful China; and laid down a solid foundation for pushing forestry carbon trade and the marketization of forest eco-services. Mr.Song Quanli, General Manager of China Forestry Group Corporation, as the first helmsman of Chinese forestry enterprises debuting on the side event, delivered an address entitled “Assume Eco-responsibilities, Develop Sustainable Forestry”. During his speech, he elaborated on the eco-responsibilities enterprises were expected to assume during its growth process: “As one big-scale state-owned forestry enterprise, it is the biggest social responsibility we should fulfill to see to the increase and value appreciation of national assets, enhance the carbon sequestration capability of forest, namely the main production object of us, and bring down carbon emissions during our production process. While we are endeavoring to cultivate man-made forests, ensure sustainable operation of forests, boost the quality and utilization efficiency of forest resources, helping farmers increase income and get rid of poverty, protect the biodiversity and ameliorate environment are also social responsibilities we cannot shun from. China Forestry Group Corporation has taken safeguarding eco-security as one of our fundamental guidelines for enterprise development and adopted many methods to voluntarily honor our ecologic and social responsibilities. For example, we have, through joint operation, established more than 800 hectares of high-tech industrialization bases for forest trees, seedlings, and flowers in nine key forestry provinces (regions) across the nation. Besides, in recent ten years, Leizhou Forestry Bureau has led local farmers in turning over 0.5 million hectares of barren mountains into forests, thus making the area as “Green Pearl” in Leizhou Peninsula. Leizhou Forestry Bureau also contributed more than RMB3 million to pave 20-strong kilometers of roads in the mountainous area, greatly facilitating the product transport and routine traffic of local farmers. Such measurements, with dual merits in greening mountain and enriching residents, have not only effectively promoted the economic development and eco-environment amelioration of Leizhou area, but accelerated the poverty alleviation of local people.” Ms. Song believed that rather than burdens, eco-responsibilities served as a driving force for enterprise to find ways to liberate mindset and go after innovation, so as to achieve win-win success in profit-making and environment conservation. China Forestry Group Corporation has been exactly running along the track towards a bright future. Dr. Qian Nengzhi, Secretary-General of China National Sand Control and Desert Industry Society (CNSC), noted that the demarcation of property right of carbon sink for vegetation in desert area would work as a new powerhouse to drive the local desertification prevention and control efforts. The timely and effective transactions of carbon trade were not only positive in boosting the recovery of vegetation in desert area, but conducive to help local people shake off poverty. Jose Louis Hernandez , Secretary of Technical Committee 207 SC7 – Greenhouse Gas Management and Related Activities of ISO (International Organization for Standardization), discussed and explored the possibility to develop the bamboo afforestation methodology for carbon sink into an international standard and put forward the suggestions to related Chinese authorities for conducting work to develop an international standard based on the methodology. Mr.Fu Xiaojie, Headmaster of the High School Affiliated to Beijing International Studies University, introduced to attendees the Climate Change Conference of Model United Nations and other colorful youth eco-civilization educational activities conducted in the school. Since Copenhagen Climate Change Conference in 2009, the school has collaborated with CGCF to explore various ways to raise students’ awareness of issues concerning climate change, ranging from encouraging students to donate their New Year Money to carbon sink to help cultivate the first Carbon Sink Publicity Forest in the nation, working out the first teaching material in the nation on addressing climate change and arranging 32 study hours for both junior and senior middle school students to learn on climate changes. Under the guidance and instruction of the State Forestry Administration and CGCF, the school has creatively offered eco-education classes and activities themed with “Carbon, Water and Biological Conservation”. The school also has grown into an eco-friendly green campus for students to chase after and explore feasible ways for their innocent green dreams, and thus acclaimed by both students and parents and spoken highly by Beijing Municipal Government and National Development and Reform Commission. These meaningful endeavors have not only offered opportunities for the all-around development for students, but laid down a solid basis for the cultivation of new generation with rich knowledge, active participation and robust publicity of bio-civilization. The enlightening addresses given on the “Chinese Pavilion” side event aroused hot discussions among attendees at both home and abroad.